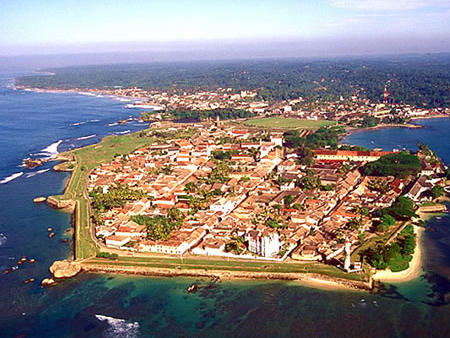 Galle has a very long history and is marked in the island of Sri Lanka in Ptolemy’s world map prepared around 125 – 150 AD. During that time Galle was a busy port. Foreign traders like Greeks, Arabs, Chinese etc have been visiting Galle for trade. Some believe that word Galle is derived from the Dutch word ‘Gallus’ which means chicken. But some believe that there was a very large ‘Gaala’ of cattle here. Gaala in Sinhala means the place where cattle are herded together. So they believe Galle is a development from ‘Gaala’. It is from Galle harbor that Portuguese led by Lorenzo de Almeida first arrived in Sri Lanka. There arrival marked an important watershed in Sri Lanka’s history because it completely changed the course of Sri Lankan history. Their arrival however, was not a planned one. It was by mere chance they came here as there ship was caught in a storm and it is the winds that brought their ship to Galle. In 1640 King Rajasinhe ii captured Galle Fort with the assistance of the Dutch. As he found later, the Dutch were no better than the Portuguese. This gave rise to the Sinhala proverb which means ‘ Like Giving ginger and taking Chillies instead. ( Inguru deela Miris gaththa vagey ) The walls of the Fort you see now as you enter were built by the Dutch according to their style of architecture. The building inside Fort are also of Dutch architecture. The Dutch were also responsible for introducing a system of roads and canals for transportation. They devised a sewage system to carry all the waste inside Fort to the sea by gravity, using the high tide. 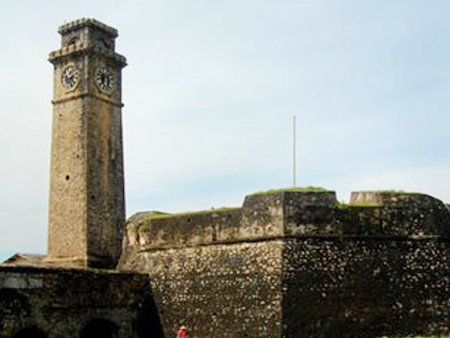 There are two main gates in Galle Fort. The walls in front of the Fort were built by the Portuguese . The Dutch have reinforced them by building several bastions. – Star Bastion, Moon Bastion and Sun Bastion. In the Gate from where you enter towards the Harbor, outer walls contain the logo of the British while you see VOC, the logo of the Dutch East India Company on the inside walls. The Aurora Bastion, Tremon Bastion, Kleipenberg Bastion, Emaloon Bastion and the light House adds more colour and interest to the beautiful view of the Fort. Some of the street names inside the Fort still bear Dutch words. 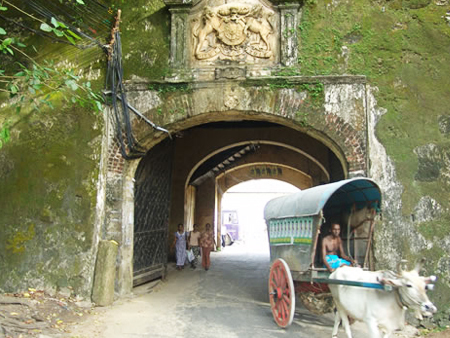 The Oriental Hotel inside Fort which was built in 1694 , was a building constructed for the use of Dutch Governor and his officials.. The Dutch Museum consists of a large collection of items used during the Dutch Period. This museum is near the Oriental Hotel while the first Marine Museum of Sri Lanka is housed near the Old Gate. Tsunami of 2004 had a devastating effect on Galle Fort. Most of the buildings were either completely destroyed or were damaged to a large extent. Those that were completely destroyed are being rebuilt afresh and those which were damaged are being renovated now. These are being done under the supervision of the Ministry of Cultural Affairs so that the new buildings and the renovations retain the old appearance which was there prior to Tsunami. The Bread Fruit Tree inside the Fortis believed to be the oldest Bread Fruit Tree in Sri Lanka. Popular belief is that the Dutch introduced Bread Fruit to Sri Lanka thinking that the highly ‘heaty’ nature of Bread Fruit would either kill them or make them sick. But Sri Lankans ate Bread Fruit with Coconut and coconut neutralized the adverse effects of Bread Fruit. Ultimately it became a delicacy among the population. It is now considered to be very tasty and nourishing. It is so popular now that there is no part of Sri Lanka where you cannot find a Bread Fruit Tree if it could be grown there. 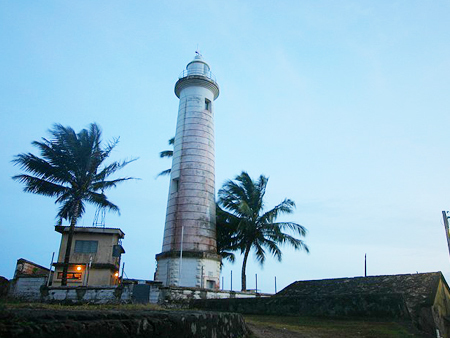 Galle therefore is a place which is of historical, archaeological and architectural significance. Galle has a multi ethnic and multi religious population. All these communities live in peace and harmony.